Kayaking enthusiasts from various provinces went to Subic Bay recently, not to compete, but to learn how their favorite activity could help promote tourism in the Philippines. The course,headed by the Subic-based International School for Sustainable Tourism, consisted of a three-day training in kayak paddling, kayak guiding, and kayak safety with an emphasis on eco-tourism. 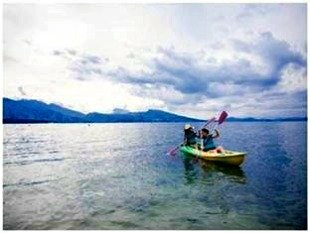 The course took advantage of the waters of Subic Bay, which varied from placid to choppy, and featured notable kayaking experts from here and abroad, who gave practical lessons on eco-kayaking. According to Buzzy Budlong, a noted kayaking enthusiast who has led an 88-day kayaking expedition around the country, kayaking can be both a recreational activity as well as a boost to local tourism in the country. “It can create jobs, boost sustainable tourism, and at the same time educate people about our coastal and marine resources,” Budlong pointed out. Ogie Empeño, a registered scuba diver from the local government of Masinloc in Zambales, said they joined the course because they would be expanding their eco-tourism program in Masinloc Bay featuring several resort islands and a unique mangrove island. “This would be a big help in our efforts to conserve the bay area, as well as promote it to boost the local tourism market,” he added. Seasoned Aussie kayaking instructor Bill Temby who gave lessons on basic kayaking skills also attended the course. The Philippines has a very big potential when it comes to kayaking, given the lengthy coastline in the country, said Temby. “Well, the conditions are completely different to start with. I was teaching in Australian waters where we have issues like hypothermia. In my country, it is competency-based and we instruct only with proper certification. It’s much more regulated there,” Temby noted. The Aussie hopes that kayaking would be recognized as a tourist activity in the Philippines and that it would be standardized to ensure safety.